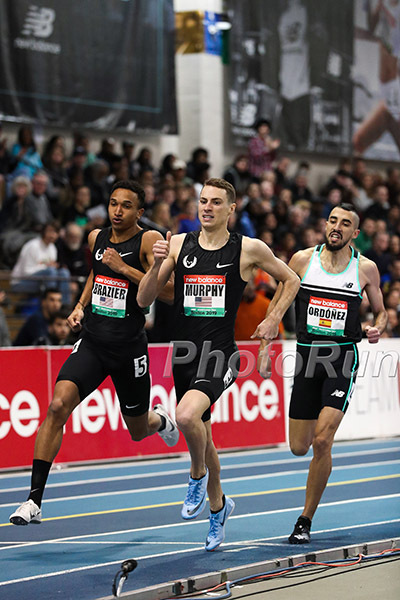 The 2019 USATF Indoor Championships are this weekend in Staten Island. And while the distance fields aren’t quite as strong as they would be in a year in which there is a World Indoor team to make, rest assured that we are not skipping writing this preview to write a preview about the Boston University Last Chance Invitational instead. This is still a national championship, after all, and it demands our respect. Because there are obvious favorites in many of the events, we’re not going to do our usual detailed event-by-event breakdown of each race. You don’t need us to tell you that Ajee’ Wilson and Shelby Houlihan are good at running. Instead, let’s hit on the biggest storylines you should be watching for this weekend in Staten Island. If you look at the entries for the men’s 600, men’s 1000, and women’s 600, it’s pretty obvious who is going to win those races at USAs. Donavan Brazier, fresh off his 1:44.41 American 800 record at Millrose, will be heavily favored in the 600. Olympic bronze medalist Clayton Murphy, who has run 1:45 and 3:53 this year, is the clear pick in the men’s 1000. And barring some sort of disaster — such as the faceplant that derailed her at this meet in 2015 — American indoor/outdoor 800m record holder Ajee’ Wilson should win the women’s 1000. We don’t want to just hand these athletes a national title. All will have to survive their prelims on Saturday, and in an indoor race — particularly the 600 — one tactical mistake can cost you dearly. Erik Sowinski, running the 600, doesn’t have Brazier’s top-end speed, but he’s a strong tactical runner, especially indoors, where he has won three national titles across the 600 and 800. World Indoor silver medalist Drew Windle (600) and 2017 USA outdoor 1500 champ Robby Andrews (1000) have both accomplished big things in their careers, and though neither has been in great form this year, they have to at least be mentioned at a national championship. Ce’Aira Brown has run 1:59 and 2:39 (1k) this year and won’t be a pushover. If there’s an upset, great. But Brazier, Murphy, and Wilson should win their finals on Sunday, which means we need another reason to get excited. And we have one: the clock. If there is a benefit to racing oddball distances like the 600 and 1000 (and it’s here we point out that it’s absurd that both of these events are being run at USAs this year, dividing the talent pool and depriving us of a Brazier vs. Murphy showdown), it is that American and world records are often on the table. Let’s examine each star’s record chances this weekend. Of the three events, Saruni’s 600 world record is the most vulnerable. He set it just last year in Albuquerque, seven weeks before running 1:45.15 to win the NCAA title. Brazier has run 1:44.41 this year — ranking him #5 all-time indoors — and he’s definitely more of a 600/800 than 800/1000 guy. 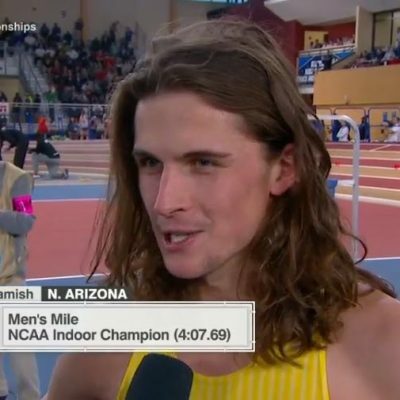 Remember, this is a guy who split 45.92 in the 4×400 in high school and ran 1:14.98 in a 600 time trial (outdoors) during his freshman fall at Texas A&M (of course, we guess we should also have you remember he went sub-4:10 in the mile in HS). On January 19 of this year, he ran 1:15.46, but that came just three weeks after he resumed track workouts coming back from an Achilles injury. He’s had another month of training since then, which means 1:14.79 is well within his reach. And given that the safest way for Brazier to win is to avoid traffic and take the race out hard, we would not be surprised at all to see the WR go down. Murphy is one of the biggest 800/1500 talents the United States has ever produced, so it would be fitting if he could claim the American record in this discipline. As mentioned above, he’s already run 1:45.92 (on a flat track) and 3:53.30 this year, and considering the lifetime PRs of the American record holder (the late David Torrence) were 1:45.14 and 3:52.01 (both outdoors), 2:16 certainly seems attainable for Murphy in the right race. Using the NCAA’s conversion table, 1:45.92 on a flat track is worth 1:44.43 on a banked track. And LRC stats guru John Kellogg says that 1:44.43 for 800 is worth 2:16.23 for 1000 (1:45.92 is equivalent to 2:18.24, per JK). JK’s algorithm doesn’t deem his 3:53.30 mile at Millrose quite as impressive, converting it to 1:45.60 for 800 (banked track), but remember that Murphy could have run faster in that race had he not gone out hard chasing Yomif Kejelcha. 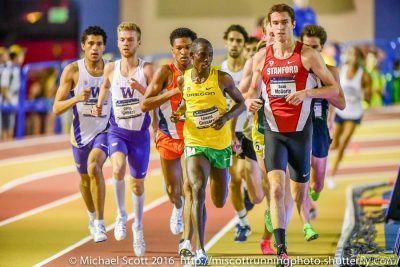 More context: Murphy ran 2:18.64 in his last crack at the 1000, back in Seattle on January 12. He’s definitely fitter now, but two seconds is a lot to make up. In his last attempt at the distance outdoors, in 2017, he ran 2:17.17 in a failed bid at Rick Wohlhuter‘s 2:13.9 American outdoor record. The biggest issue for Murphy is that this is a championship final, which means that if he’s going to attack the record, he’ll have to do it on his own. But if he commits to getting after it, the American record could fall. The world record of 2:14.20 would require a monster effort and some terrific pacemaking; it’s not going down this weekend. Wilson has run over a second faster this indoor season at 800 meters (an American record of 1:58.60) than AR holder Jen Toomey ever ran, indoors or outdoors (her pb is 1:59.64). And in the 1500, Wilson’s PR of 4:05.18 is superior to Toomey’s 4:06.24. That gives Wilson a very good shot at the American record, should she choose to chase it (JK converts her 1:58.60 to 2:34.79 for 1k). The world record is the more interesting proposition, but we don’t think it will fall. Maria Mutola, the 2000 Olympic champion, was a total stud, especially indoors, where she won seven world titles in the 800 and ran an indoor PR of 1:56.36. Last year, Caster Semenya took a shot at a fast 1000 outdoors in Berlin and her time (2:30.70) was barely faster than Mutola’s indoor WR. So it’s hard to imagine Wilson running just as fast without any competition in February. LRC predictions: Brazier gets the WR and Wilson gets the AR, but Murphy falls just short of the AR. 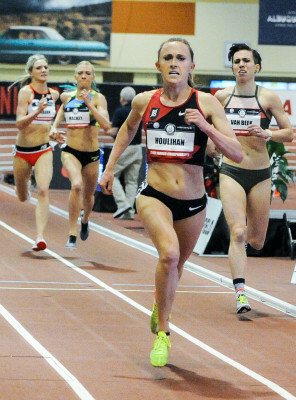 2) Can Shelby Houlihan make it 10 straight US titles? Houlihan is entered in both the mile (Saturday) and 2-mile (Sunday) at USA Indoors and it would be a shock if she did not win both of them. 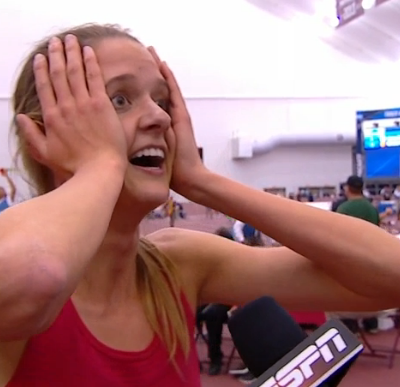 She has faster PRs, a better kick, and a bigger engine (14:34 American record in the 5k) than anyone else in the field; outside of a fall, illness, injury, or act of God, it’s hard to envision any scenario in which Houlihan loses. The more interesting question: when is the next time anyone beats Houlihan at USAs? Houlihan, who turned 26 earlier this month, is in her prime, and last year’s win over Jenny Simpson (now 32 years old) at USAs felt like a changing of the guard. That brought an end to four straight US outdoor 1500 titles for Simpson, and Houlihan could easily reel off a similar streak in that event. Maybe a collegian — Colorado’s Dani Jones? — rises up to challenge her, but Houlihan is at such a high level right now — we ranked her #3 in the world at 1500 last year — that she would have to decline for anyone else in the US to have a chance. Things can change quickly in this sport, so we don’t feel comfortable predicting beyond a couple of years. But our bet is that Houlihan’s next defeat at USAs comes at some point after the 2020 Olympic Trials. One more note on the women’s mile/2-mile: both races will be run as two-section finals. Houlihan, though she has no seed time for either race, will be in the “fast” section of both. Houlihan’s Bowerman TC teammate Colleen Quigley was not as fortunate. Quigley, like Houlihan, did not have a qualifying time and Monday said that if there was not a second section, she would not have been accepted into the meet at all. But because enough women hit the auto standard to necessitate two sections, USATF has the prerogative to fill the second section, which is how Quigley got a bid. Given that Quigley is the top seed in the mile, and the mile comes first (it’s on Saturday, the 2-mile is on Sunday), Quigley could simply scratch the 2-mile. But if she chooses to run, she will do so in the slow section. The biggest impact that the two-section finals will have is that the runners in the “fast” section cannot afford to dawdle, otherwise they’d risk being displaced by athletes from the “slow” section. Yes, we’d love to see Paul Chelimo, Matthew Centrowitz, and Evan Jager in these races. But none of those men — who have combined to win 19 US titles on the track — will be in action this weekend as Chelimo is making his half marathon debut in New York next month while Centro and Jager have been conspicuously absent from all racing this year. That means that some younger athletes have a chance to shine in Staten Island. In fact, of the 34 men entered across the mile and 2-mile as of Thursday (12 in the mile, 23 in the 2-mile; Eric Avila is entered in both), only one has ever won a US title on the track: 33-year-old Will Leer, who claimed the mile and 3k crowns in 2013. Considering Leer hasn’t made a US final in almost five years, we don’t expect him to add to his total this weekend. So who can win? Sunday’s mile should come down to Craig Engels of the Nike Oregon Project and World Championship finalist Johnny Gregorek of NJ*NY Track Club. Gregorek edged Engels by .02 at USA Outdoors two years ago for the final spot at Worlds, and we’re sure Engels would like nothing more than to earn his first national title by returning the favor. He heads in with the edge, having defeated Gregorek head to head at Millrose, by a pretty significant margin (1.34 seconds). But in a championship race, things could be different. One of those two guys is likely your winner, but keep an eye on Oregon alum Sam Prakel, who beat both Engels and Gregorek at USA Outdoors last year to finish 7th. He was last at Millrose in 3:59, but that was due in large part to his decision to run super-aggressively early on (57.71 at 409, 1:26.84 at 609). In the 2-mile on Saturday, the three names that jump out are Izaic Yorks, Drew Hunter, and Sean McGorty, all of whom are 24 or younger. Yorks was the US runner-up at 1500 outdoors last year but has only raced twice indoors; a 7:55 3k in Seattle on January 12, and a 3:58.6 split on the anchor to help his Brooks Beasts squad claim the 4 x mile world record on January 26. 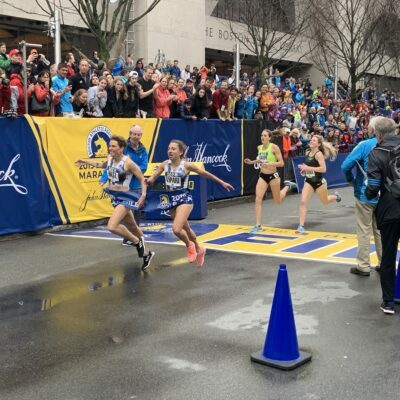 Hunter was last seen finishing 9th at USA XC on February 2 — a strong performance for a 1500/5k guy in his first ever 10k — while McGorty looked great in running 13:21 to knock out the Worlds standard for 5k at BU on February 8. That’s not a ton to go off, but we’ll take McGorty, the 2018 NCAA outdoor 5k champ, FTW as he looked very smooth in the 5k in Boston. If he hasn’t dropped Yorks with 100 to go, however, he could be in trouble against the 1500 specialist. We should also note that, because there are 23 guys entered, the 2-mile will be run as two sections. And because Hunter doesn’t have a qualifying time, he may end up having to run in the slow section, which would make it even tougher for him to win. One last thing: it’s a joke that there are going to be two-section finals in the 2-mile. Either a) Put everyone in one heat with some sort of massive three-turn stagger or b) Do what the NCAA does and say you’ll accept a maximum of 16 people per event.